Star Wars land Coming to Disneyland Paris Discoveryland in 2015 ? Since two months DLP fans forums are talking about something pretty exciting: a "Star Wars land" is supposed to come to DLP Discoveryland in 2015! Disney Central Plaza forum detailed what we might expect in this Star Wars land and so far it is listed on DCP as a "rumor". Of course, i tried to know what is true in all this and, yes, from what i've been told it seems that DLP Imagineering is indeed working on a Star Wars Land project for Discoveryland. I will explain you in details why this Star Wars land is very probably going to be build, but before let's have a look to what is supposed to be planned. 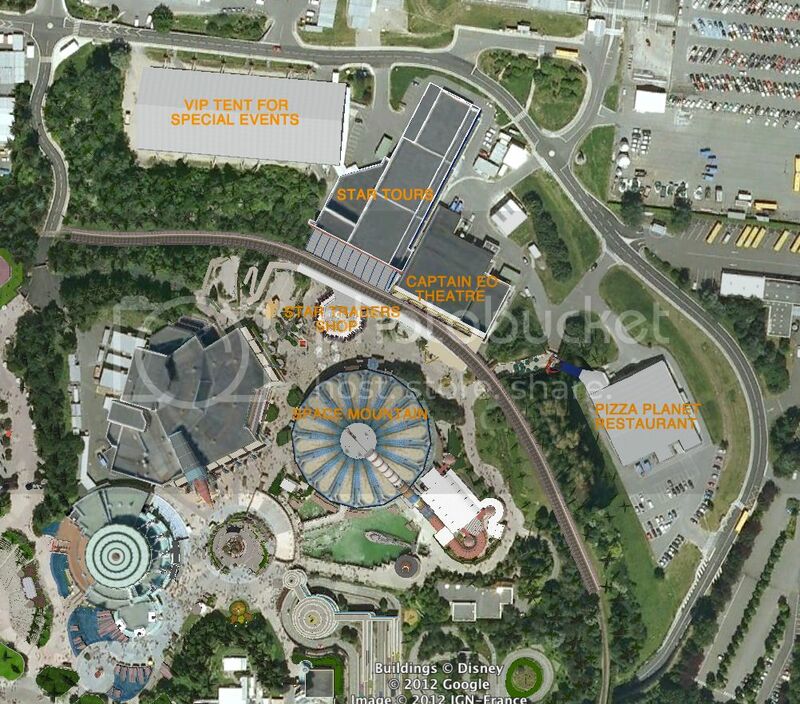 The plan is not only to bring Star Tours 2 at DLP Discoveryland but also to transform what is now the Captain EO theatre, the Star Traders shop as well as the Pizza Planet restaurant to create a "Star Wars land" and as you will see on the Google Earth screen capture below they not only have plenty of room backstage to do it but probably will even have enough room in the future to add new rides if necessary. The back of Discoveryland already don't have the same architecture than the front, so this Star Wars land shouldn't be a problem, esthetically speaking. What you must NOT expect: I found back a Tim Delaney rendering - which is reproduced in my DLP book among 250 others WDI artwork and that you can find HERE - and in this artwork Tim had envisioned, a long time ago, a kind of Star Wars land with a full scale Millennium Falcon and a Space Mountain dome designed as the Death Star. This will certainly not happen, so don't even think about it as Space Mountain will definitely keep his beautiful dome as it is right now. 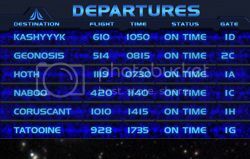 What you CAN expect: Of course, Star Tours 2 will replace the original version and the pre-show will have the same changes than in the U.S versions, but according to the DCP forum - and for a big part confirmed to me - the plans apparently are to do big changes in the Star Tours post-show, which will be welcome as since IBM is not anymore the attraction sponsor the great games which were there on DLP opening day have been replaced by arcade games. I don't know yet exactly the DLPI plans but a Star Tours shop will very probably take place in this quite large area, hopefully with great theming. Close to the exit the Star Traders shop might become a Star Wars photo location and what kid wouldn't be happy to have his picture with his favorite Jedi? Young kids will also probably be happy with the plans for what is now the Captain EO theatre as apparently DLP is planning to replace it with the Star Wars Jedi Academy like the popular one at Disney Hollywood Studios. Sure, if you're 8 years old its more enjoyable to become a young padawan - a Jedi apprentice - but i think it will be a cute and fun addition even if DLP Jedi Academy may not be located outside as it is at DHS for obvious weather reasons. All of you have heard about the DHS Jedi Academy but some may have never seen it in real so i post below a video showing the full DHS show. 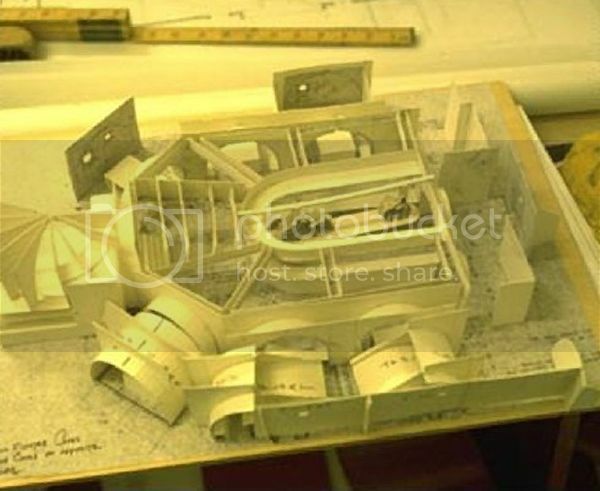 And here is the same model but showing the inside. 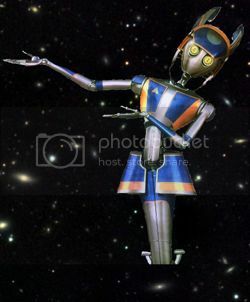 Here are two pictures, the first one is the original model for the movie, and the next one is another model, non-official. 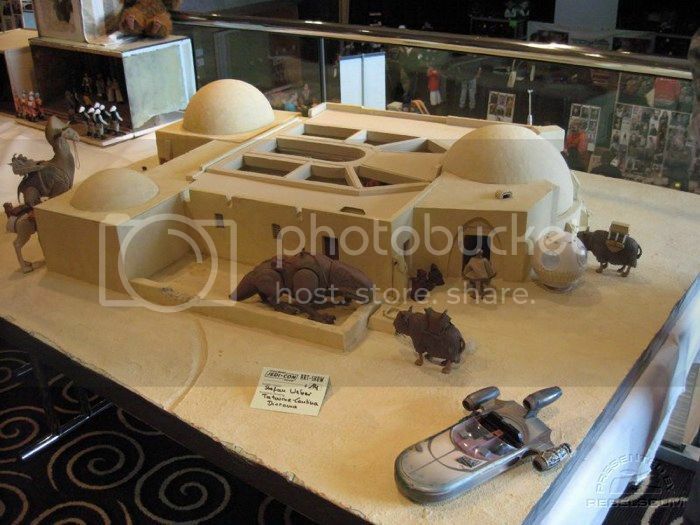 I remind you that in the movie the Cantina is located on Tatooine, in a desert environment, which mean that DLPI would probably have to recreate a bit of desert landscape all around it, which is not the most difficult thing to do. And they have the space to do it. Some additional creatures like the one you saw on the diorama and a land speeder waiting at the entrance would be welcome, too. 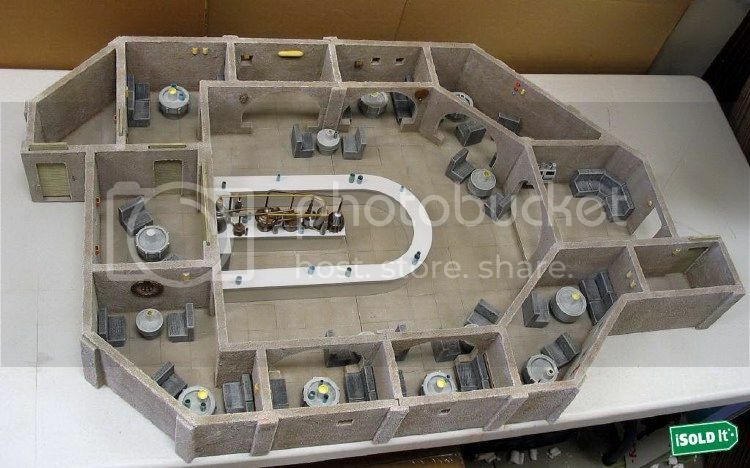 To be perfectly honest, this "Cantina" addition is the one on which i didn't had confirmation yet but it'll make sense to build it and if this Cantina project is finalized you can be sure that Lucas Film will keep an eye on the theming to make sure that the restaurant will be faithful to the original one. 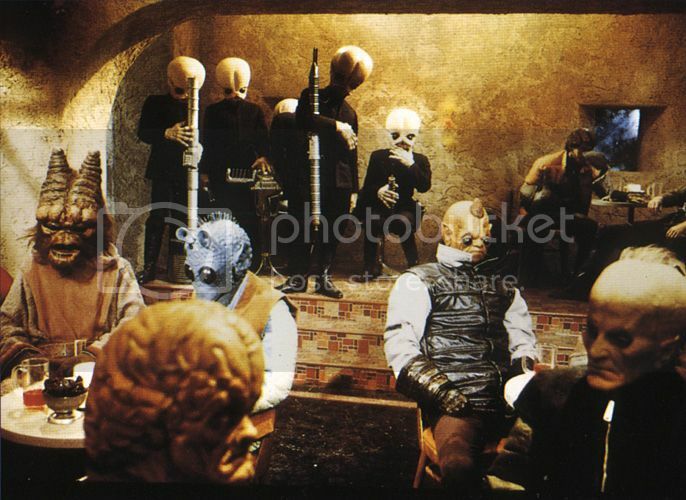 This next picture will give you an idea of where is what in La Cantina. And what about the Cantina musicians, by the way? They have to be there, right? 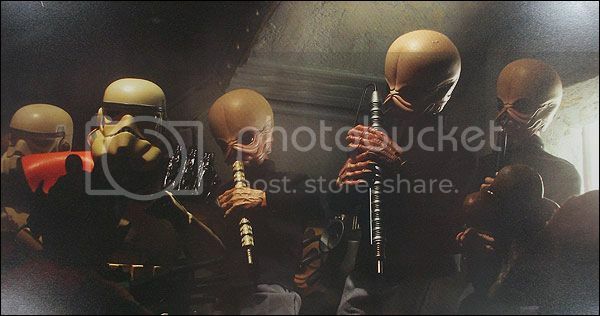 DLP have the choice of real musicians wearing masks or audio-animatronics musicians. 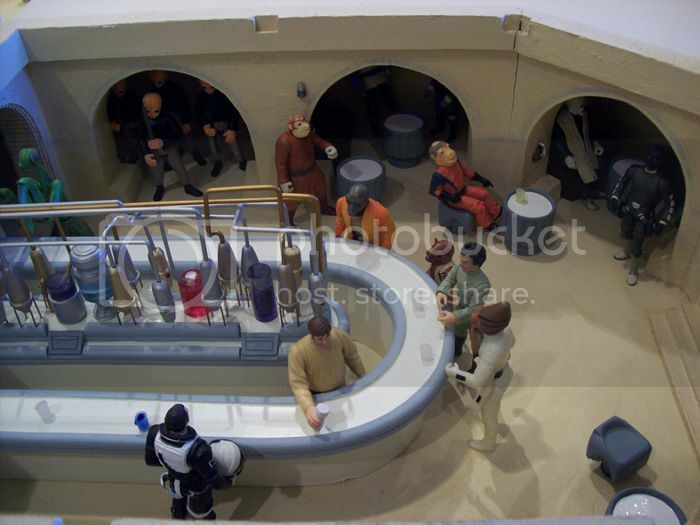 My guess is that DLP might prefer "real" one for financial reasons but WDI AAs would be welcome..
For those of you who don't remember the Cantina scene from Star Wars Episode 4, here is the video. Is this Star Wars land going to be build at DLP? Very probably, yes, and here is why: One year ago, during a press event, a dinner was organized with a selection of web masters and Philippe Gas, DLP CEO. I was part of the dinner but it's another web master who asked him if DLP was planning to replace Star Tours 1 by Star Tours 2. To what Philippe Gas answered that they will be very happy to do so but unfortunately the attraction have a cost - read: an important cost - and for the same cost DLP could have a brand new attraction. One of the problem is that DLP had bad experiences with previous upgraded attractions. They did Space Mountain Mission Two and expected it to be a success as big as they had in 1995 when Space Mountain opened, and it hasn't been the case. And Captain Eo just brought in more guests than HISTA during one week or so. 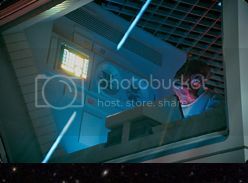 So, we can understand why DLP execs can a bit dubious with upgraded rides even if in this case i think they're wrong as everyone will agree that Star Tours 2 is considerably better than the first version. 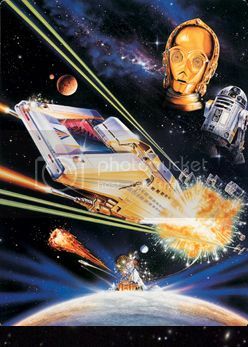 But, at the time of this dinner we didn't knew the real price of Star Tours 2, and it was hard to understand why Philippe Gas thought that ST2 cost was high. Thanks to Oriental Land company who always reveal the cost when they bring a new ride at TDL or TDS we know now that TDL will invest 7 billion Yen to bring Star Tours 2 - $84 Million which makes around 63.5 M euros. Even if the costs are always a bit higher in Japan because of anti-sismic regulations, the price for DLP is certainly not under 50M euros, and probably closer to 55M. I can understand now why Philippe Gas thought that it's quite a lot of money to upgrade a ride, as popular as it can be. Not to mention that it's also harder for DLP marketing to advertise an upgraded ride than a brand new one. 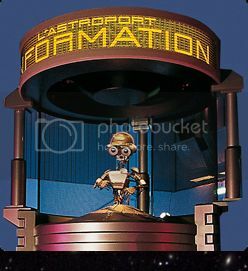 But DLP have two problems: the first one is that Star Tours 2 will be introduced to all the others parks next year except at DLP, and the pressure by DLP fans would surely grow in the next years. And also, to put it more simply, the original ride is really getting old, so sooner or later DLP couldn't escape to upgrade it. 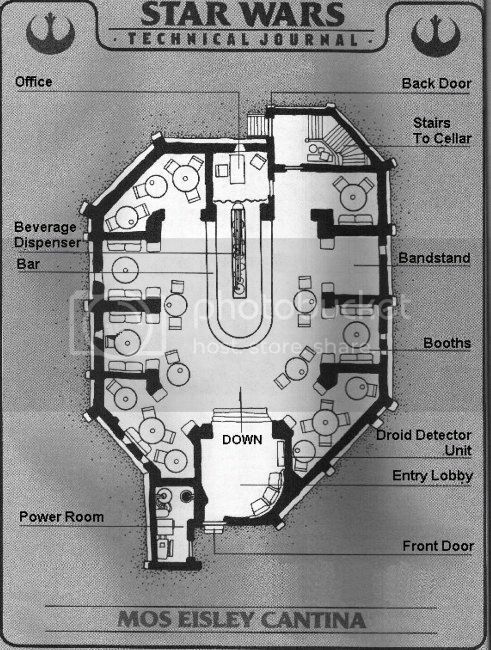 The second problem is located next door to Star Tours. As i told you Captain EO is not tremendously successful and obviously they can't keep it for years and years. Captain EO closed on April 2 but the main problem for DLP is: what can they put in instead of EO? WDI don't do anymore 3D movies considering - and they're right - that because a new 3D movie is released almost each week in normal theatres it's better to use 3D technology in rides - like in Toy Story Mania or in the upcoming Ratatouille ride at WDS. And it's at that point that someone probably came with this brilliant idea: what about having a Star Wars land in the back of Discoveryland? And this concept change everything as DLP marketing will be able to "sell" or advertise not only an upgraded ride but a whole new land, and a new land dedicated to one of the most popular movie mythology in the world! 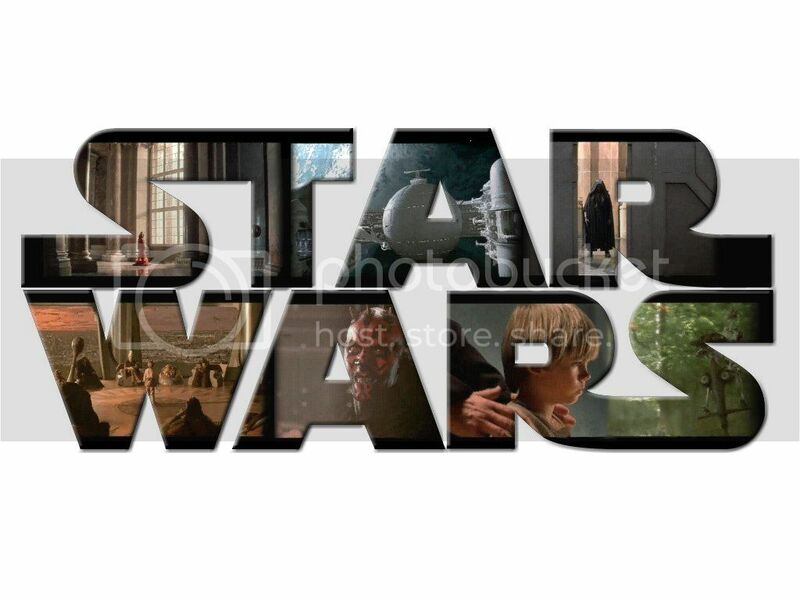 And God knows that there is a lot of Star Wars fans in Europe. Not to mention that, as i told you, there is still plenty of land backstage to eventually add a new Star Wars attraction in the future if needed. Honestly, if they do it for real i think it's a very smart move from Philippe Gas and DLP Imagineering as this Star Wars land is probably the best way to resolve both the ST1 and Captain EO problems at the same time. For sure, this Star Wars land will cost more to DLP than a simple upgrade of the ride but the benefit on many points will be greater. 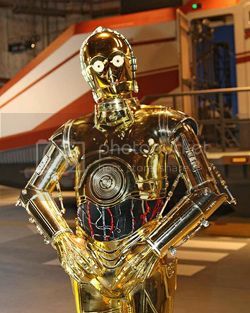 For instance, once DLP will have this Star Wars land why wouldn't they organize Star Wars week-ends like they do at WDW? It's very popular, and for sure it would bring fans from all over Europe in the park...and in DLP hotel rooms, right? So, for all these reasons, i'm quite sure that a Star Wars land will come to DLP, and from what is said on the DCP forum it won't be before Ratatouille opening which is scheduled for 2014. But 2015 might be the year that both Jedis and Empire forces will land again at DLP Discoveryland!